The great Indian wedding season hasn’t spared you! As a to-be-bride who is soon going to get busy with the mehndi application, haldi ceremony, sagan, and sangeet, Zuri has some suggestions for your pre-bridal functions. Take a look at 22 amazing outfit ideas. Choose from our trendy recommendations and look gorgeous during the entire wedding week. 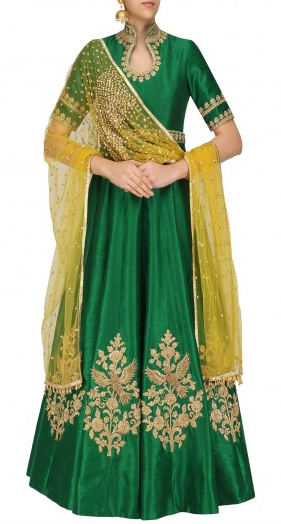 An Anarkali is a ravishing outfit for an Indian bride-to-be. It can be worn at a pre-bridal function with a lot of style. This extremely versatile Indian outfit idea amps up the fashion statement bringing in a lot of grace to one’s overall personality. An Anarkali with dupatta can be worn in different ways. A chunni or dupatta adds a glamor to the entire outfit. The chunni is one such asset of the outfit which can transform the look. You could either drape it around your neck or tweak the look a little for different occasions to just simply change the look of your outfit. We recommend our to-be-brides to look suave and stylish in an Anarkali with chunni on her pre-bridal sangeet ceremony. She can also opt for a palazzo or a skirt underneath her Anarkali. Besides, it would be easier to get mehndi applied on her feet and legs this way! One of the most stylish Indian outfits, a lehenga need not just be your wedding outfit. You can also go for a lehenga-choli or a lehenga skirt with crop top representing minimalist theme on your pre-wedding ceremonies. Best suited for a mehndi occasion, a to-be-bride can look hot and pretty, both at the same time in a crop top with cape teamed up with a heavily embroidered skirt. Gold brocade skirt and a plum or burgundy crop top are really trending this season! 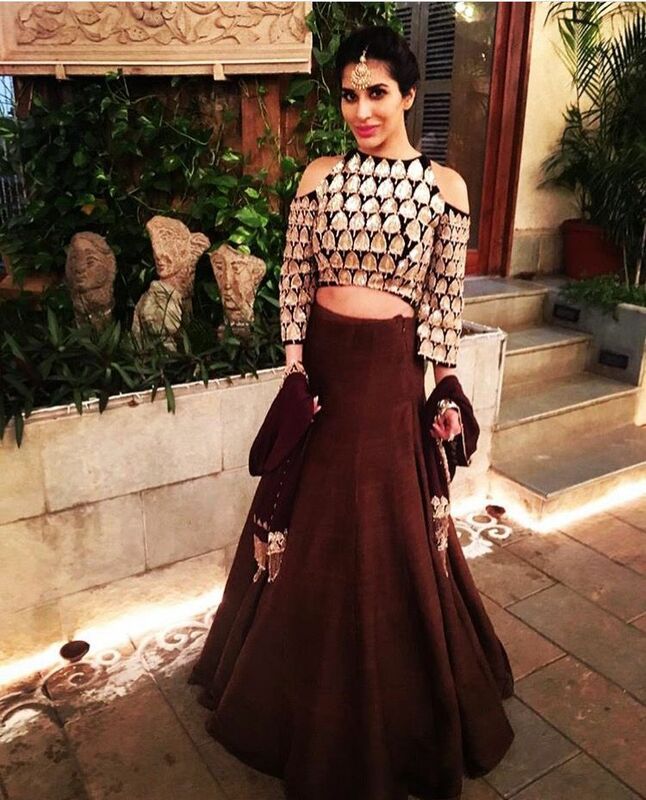 If you are looking to set the dance floor on fire at your sangeet or cocktail party, then we recommend an off-shoulder cape and skirt. For the to-be-brides who want to look effortlessly stylish and don’t want to get too hassled with a dupatta or chunni, this outfit is for you! 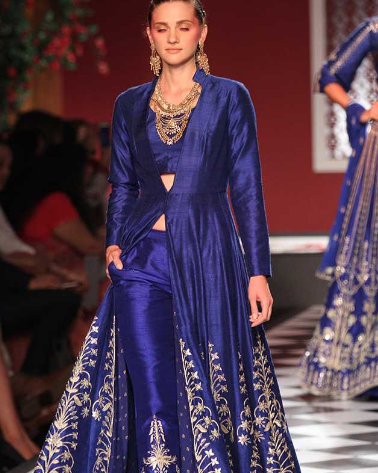 Anarkali-gowns to floor-length Anarkalis, this Indian outfit continues to stay on top of our must-own-list. 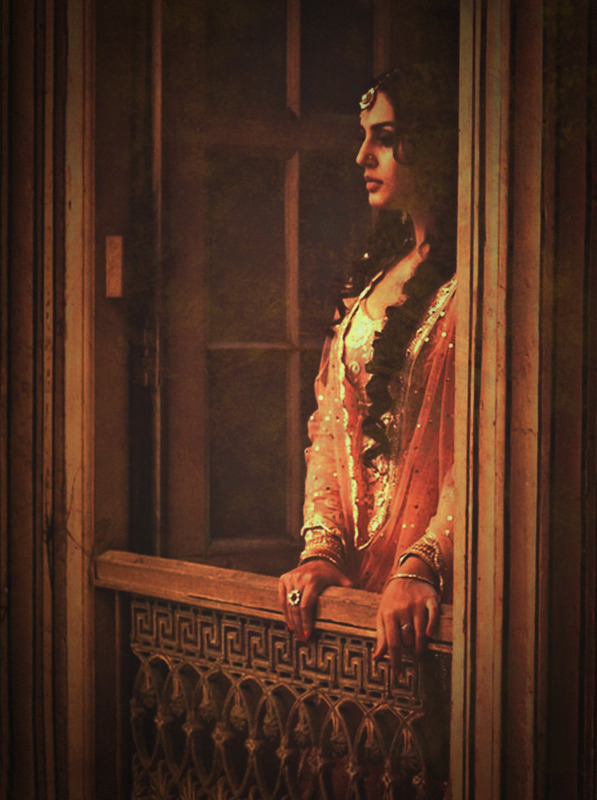 An Indi-western Anarkali symbolizes opulence, grandeur, and beauty. You can also team it up with a pair of cigarette pants and have a jacket on top to protect you from the winter chills. From Banarsi to Bengali to Kanjeevaram, a to-be-bride is bound to look elegant and absolutely bridal in a 9-yards clothing which can be draped in a million ways. Revive the art of wearing India’s traditional outfit this season by draping it stylishly. You can also play around with the blouse. For instance – pairing a teal silk saree with a rose patterned bolero instead of a traditional choli. In the end, twirl the pallu around the neck and wear it as a scarf, to beat Indian winters. Or how about- a red raw-silk saree with a gray polo neck choli, secured with a belt? Wow, isn’t it? Pre-stitched or pre-draped saree is less messy an affair and a good spot to be in if our modern-age-bride isn’t patient enough to try out a good styling technique of draping a traditional saree. Moreover, a pre-draped or ready-to-wear saree adds convenience and grace. The outfit is crafted so ingeniously that it can be worn in just one-step – like putting on a skirt. Also, you don’t need to buy a petticoat separately because pre-draped saree comes with the attached stitched petticoat. 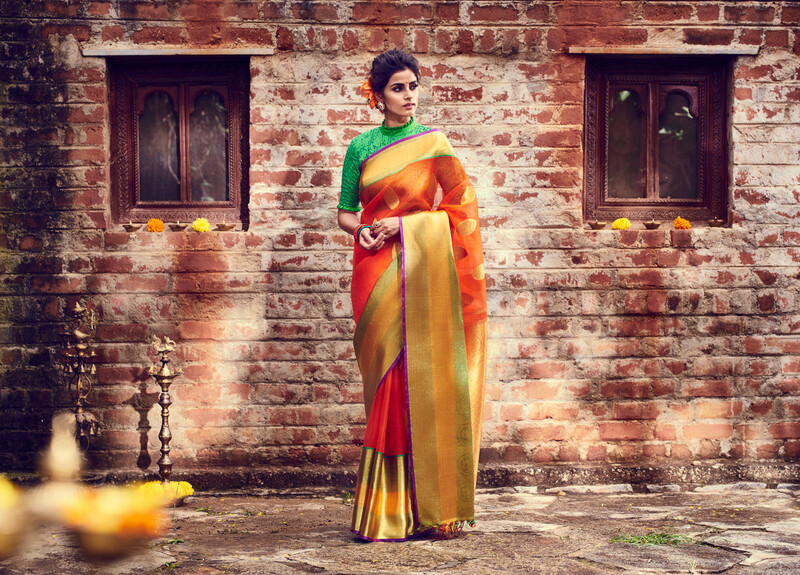 Instead of spending time draping a traditional saree, you could actually choose from the unique and trendy styles in offering. Dhoti-style, pleated-jacket style, or the one with leggings (instead of a petticoat). So ladies, here is hoping that you have got an idea about the style you are most likely to go with. A few more ideas are here for your inspiration.